The convention journal includes a record of the proceedings and results of the annual 152nd Convention of the Anglican Diocese of Pittsburgh held November 3-4, 2017. The journal includes: lists of members of the diocesan staff and governing bodies, unapproved convention minutes, 2018 budget, 2017 ordinations and letters dimmissory, recent audit report. For printed copies, please contact the Diocesan Office. Gathering 2018 promotional ad that fits in 1/4 page in PNG image format. 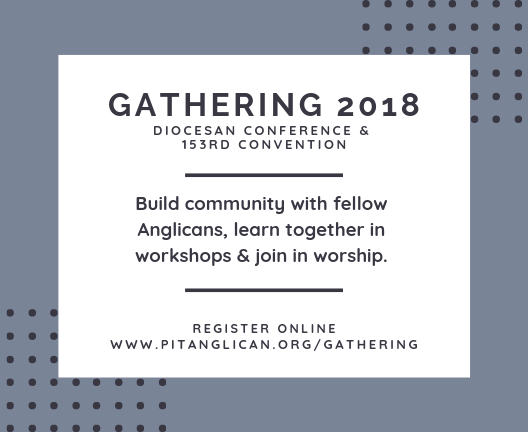 Gathering 2018 promotional ad that fits in 1/4 page in PDF format. Printable 1/2 page bulletin insert for Gathering 2018 in Word doc format. Two half page sheets are on this document for easy printing. Printable 1/2 page bulletin insert for Gathering 2018 in PDF format. Document of the governing rules and charters of the Anglican Diocese of Pittsburgh. Last revised in November, 2016.